With a few pieces of hardware, these instructions, and Twilio Programmable Wireless you can disconnect your devices from their wired perches and deploy them into the field where they'll be more useful. 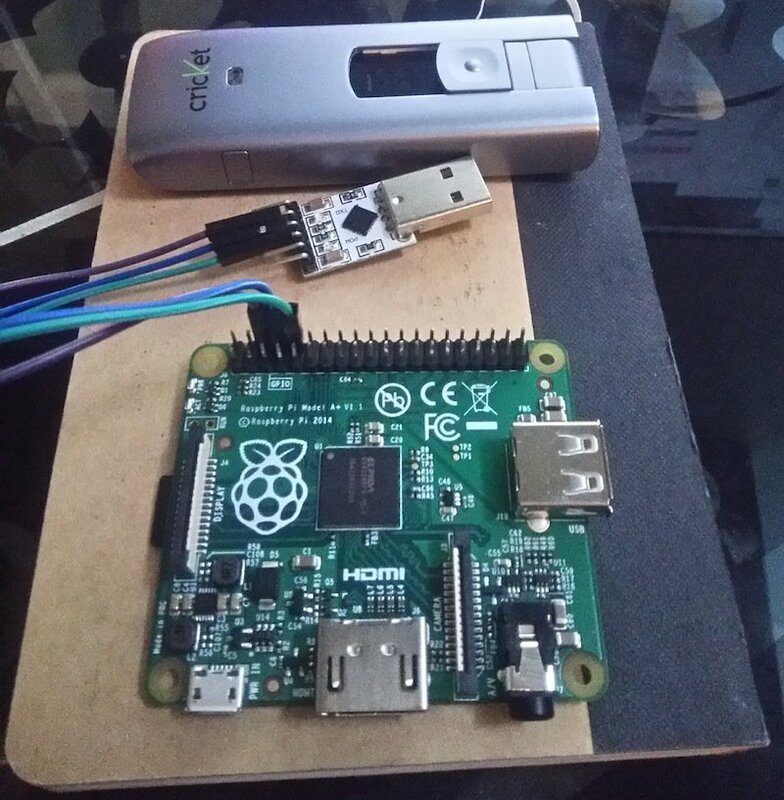 In this quickstart, we'll use a Raspberry Pi running the Raspbian operating system, a USB to UART bridge, a Huawei E397 (Cricket) USB Modem and some packaged scripts and finish with a Raspberry Pi on the internet using cellular connectivity. This particular quickstart will leave you with a headless Raspberry Pi, one that you manage via serial or SSH and not a monitor, keyboard, or mouse. I'm in. Show me how to disconnect! Already have a Twilio account and SIM card? Go ahead and skip ahead to the next step to register and activate it. Before you can connect with Twilio Programmable Wireless, sign up for a Twilio account. Next, visit the Programmable Wireless Console. On the Orders page, you can purchase a set of 3 starter SIMs or make a larger custom order. Note: Orders of 10 SIMs or more will be delivered with the SIM cards already registered to your account. Sounds excellent! How do I connect the SIM? Once you receive your shipment of SIMs, choose one of the cards and remove it from any packaging. Once removed, head over to the Register a SIM page in the Wireless Console. Follow that up by next picking a distinct Unique Name for this SIM. Next, select a rate plan from the options provided. By default, Twilio has entered rate plans which are close to what are used in the field. Although beyond the scope of this quickstart, Rate Plans let you control every aspect of what your device can do in the field... and how much data it can use. When you're happy with the naming and rate plan, 'Activate' the SIM card. Note: While you can use small amounts of data to evaluate Twilio before the SIM is active, you'll need to activate it for real-world workflows. I'm active! Let's grab some Raspberry Pi. Since our goal with this setup is a headless Raspberry Pi, we want to start with the lightweight version of the Raspbian operating system on our Pi before we make our changes. Note: This image will not always be up to date with the most recent Raspbian release - be sure to update the image if you choose to install it. Always check the Raspbian download page for the latest image. Depending on whether you already have the driver installed for your USB serial adapter or not, first install your serial driver before attempting these steps. Driver details should be included with the cable or adapter you purchased, or found online with a search. Download the drives for your operating system if you're using the serial adapter from the hardware requirements section above. Once the serial adapter is working, there are two paths to setting up your Pi. You can either edit the boot configuration of the Raspberry Pi on the machine you use to flash Raspbian or on the Pi itself. Depending on your preference, select one path to enable the onboard serial connection and increase the maximum current available to USB devices. Load the MicroSD or SD card and navigate to the boot drive root, or /boot/ depending on how it appears. Open the file config.txt. And save the file. You can now safely eject the card and insert it into the Pi. Do not power it up yet. Skip the next section. Insert the MicroSD or SD card into the Raspberry Pi. Plug an HDMI monitor into the HDMI port of the Pi. Plug a USB Keyboard and Mouse into the Pi (possibly using a USB hub). Once you are satisfied with the physical setup, power on the Pi by plugging in a MicroUSB Cable. Once you have verified the Pi is fully powered down, remove the MicroUSB cable powering the Pi. The following pin descriptions are only for the serial adapter listed in the hardware requirements above. Search for your cable's pin descriptions if you chose an alternate version. First, connect GND on your serial adapter to pin 6 on the Pi (the pin on the adapter may instead look like ⏚ with a pointed bottom). Ensure a snug fit, GND is the reference voltage for the other signals and communication will be unreliable if the connection is loose. Next, very carefully connect pin 8, Tx, on the Pi to Rx on the Adapter. Note: this is not a typo - pins are labeled from the perspective of the device, so where the Pi receives you want to transmit. Similarly, connect pin 10, Rx, to Tx on the adapter. It's time to fire up your Raspberry Pi. Double check and make sure your SD card, SIM card, UART cables, and now that the power adapter is plugged in. You should see the red and green lights on your Raspberry Pi start flashing. On Windows, we recommend using PuTTY. Your adapter will appear as a COM port, and PuTTY will allow you to connect. Your Raspberry Pi model may or may not have provisions to connect to the internet onboard (the A+, for example, doesn't). If it doesn't include connectivity, the default installation of Raspbian includes drivers for many USB WiFi and USB Ethernet adapters. While you will end this guide with cellular internet connectivity, temporarily attach a USB WiFi or Ethernet adapter. If you are using ethernet, connect a cable between the Pi and a modem, router, or switch to give it connectivity. It's now the moment of truth. First, plug in the USB Modem to the Pi. Then, power on your Pi using the MicroUSB cable and watch your serial terminal. When presented with a login prompt, log in using the username pi and the password raspberry by simply typing in your serial terminal. If necessary (usually for WiFi), connect the board to the internet via your network. I feel us getting closer - let's continue! And... actually, that's it! Bring down your current temporary internet connection with one of the following commands. (If it doesn't work, you can use the ifconfig command on the Pi to see the name of your connection). And there you have it - cellular connectivity! Now that it works, let's set up the Pi to connect to Twilio at startup. If you have issues connecting, first check your modem is not in mass storage mode. If it is correct, try to get a clear view of the sky or move to an area of better connectivity. If you still have issues, feel free to talk to support. Whenever the Pi power cycles, we want it to automatically connect using Twilio. However, if the USB modem isn't inserted, that's a waste of time - we won't be able to make the connection. If the modem is connected we can also save some power by powering down the HDMI and RCA connection (it is going to run headless, after all). Now, when you start the Raspberry Pi it will watch for the USB modem's connection. If it sees the 'GSM' string, it will automatically disable the displays and connect to Twilio with ppp. Nice! It works - what's next?